About a month ago I did something I never do: I stood up to my family. Parents, in-laws, siblings, the whole bunch. Typically, when loved ones upset me, I let it go in the interest of peace. But over the summer as we all spent more time together cuddling the newest generation of lives — my daughter, and my young nephew — I started to realize that there was a theme running through our family conversations that needed to come to an abrupt end. When we gather together, it’s often around a table. Isn’t that how these things go? From holidays to random Sunday afternoon meet-ups, food and drink is usually at the center of the entertainment. But as much we all enjoy nourishing our bodies with the flavors that have been passed down from one generation to the next, or swapping stories over a great bite at a favorite local restaurant, there was a permeating problem at the center of all this food and fun. The talk about body image — good, bad, and ugly — seemed to always be present. “I really shouldn’t be eating this,” or “My diet starts tomorrow” are regulars. Then there’s the good old, “Ugh. I’m so fat.” Even positive things have a negative spin. “Dad, you look great!” is usually returned with a joke about the giver of the compliment needing to have his eyes adjusted. It just never ends. The weird part? Not a single person on either side of the family needs to lose weight for medical reasons. We are all within a healthy range. I spent most of my life up until becoming a mom completely fixated on my weight. It’s embarrassing, sad, and true. But it wasn’t until I had my daughter that I started to become aware of just how much the people around me were talking about it, too. I don’t blame my parents for my body image issues — of course the media and the high school dating games didn’t help. But I am looking around me now and realizing how cautious we need to be at home. I’m over here trying to raise a healthy little girl who reaches for vegetables and enjoys a sugary treat, who wears what she wants and doesn’t feel ashamed. A little PSA as we go into [my daughter’s] second year of life and she becomes aware of language. I have a strong request. Please feel free to shower her with compliments because she is beautiful and I want her to know it! However, as many of you know, I faced a lot of challenges with my body image and self-esteem growing up. There were seasons, even years, when I did unhealthy things just to be skinny. I do not want this for my daughter. We ALL as a family need to be better about how we discuss our bodies (and hers) in front of her. This includes: any discussion of who needs to lose weight, who doesn’t, who has a belly, who lost a ton of weight and looks amazing. Etc! Also, comments on what we are eating and how it will affect our bodies, whether it’s an “Oh my goodness, I shouldn’t have eaten that,” or a, “She’s getting to be such a chubby baby!” And so on. I, myself, said at dinner the other night that I am hoping to lose five pounds. That is a thought I can keep to myself. We all have said things we shouldn’t in front of our children and today is a great day to start doing better! Our focus should be on how proud we are that we are moving and staying active. On how great it feels to gather around the table and enjoy a homemade meal and some much-deserved wine (and even dessert) as a family. On what fun it is to splurge and do a little shopping for new clothes (no matter where we are with our “goals”). 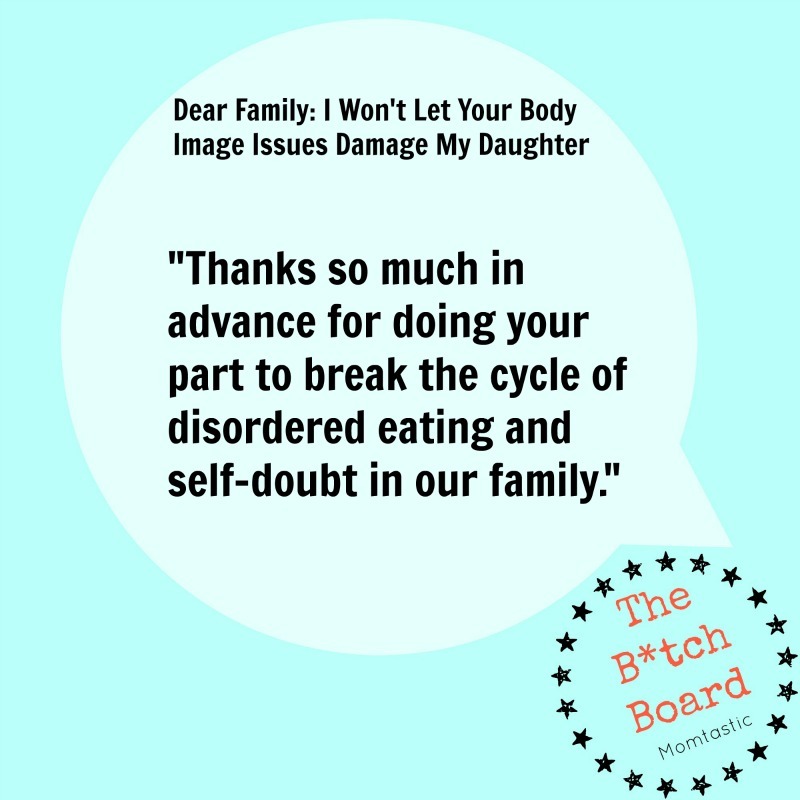 Thanks so much in advance for understanding and for doing your part to break the cycle of disordered eating and self-doubt in our family. PS. If you have any questions about whether what you’re about to say falls into this category, chances are it does! The last thing I want to do is make my family feel like they can’t be honest or discuss their feelings about their bodies. But I am adamant that doing so in front of a child, especially a girl, can do major harm. I want my beautiful daughter to grow up hearing praise for not only her looks but more importantly her heart and her actions. That said, I am a firm believer that it is not only okay, but positively impacting, to help self esteem start at home with compliments. However, we really need to tone down the negative stuff and certainly cut out the weight conversation. Even if my mom, for example, is saying how amazing it is that my sister-in-law lost the baby weight in a matter of weeks, she means this as a compliment to the SIL. How do I hear it? As a message that I should be ashamed of how long it took me. All of a sudden I saw these scenarios playing out in a few year’s time. What happens if my daughter one day has a little girl cousin or sister, and is faced with hearing about how tall and thin she is, and how admirable that is? What if my daughter doesn’t look or feel that she looks that way? The cycle stops now, is all I keep saying to myself over and over. My husband and I make an effort, individually and together, to eat healthfully and stay fit and active. We are showing our daughter even now at just a year old that family walks and playtime are important. We eat a balance of veggies, lean meats, healthy fats, and carbohydrates. We try. We wake up every day and try to be healthy physically and mentally. For us, but more importantly for her. I don’t have all the answers — of course I don’t. I just looked at our proofs from this year’s holiday cards and despite my adorable daughter and sweet husband in the photo, the first and only thing I seemed to notice was the thickness of my thighs. I will be battling with my own self image and eating issues for the rest of my life, like an alcoholic or any other addict battles theirs. But one thing I know to be true is that I can do better for my little girl than the people around me did for me. Yesterday, as she shoved fistfuls of decadent cake into her cute little mouth for the first of many birthday celebrations that will be centered around food, my heart was so full. I know I’m doing the right thing by raising her on (mostly) healthy food. But the last thing I ever want this girl to do is doubt herself or feel ashamed of her body. Part of the process is letting the good times be sugary and fun, and certainly keeping the fat-talk out of the equation entirely. I’m just glad that my email was well-received. They didn’t all respond, but they’ve made a huge effort to change. 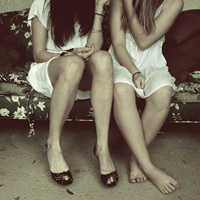 The last few times we’ve gotten together, there was so much joy and shockingly no mention of weight or body image. I was proud of my clan for taking my words to heart. I know as well as anybody that changing the way we speak — and think — about our bodies is no easy feat.